I’m always chatting to people about 5-a-side. Friends, acquaintances, taxi drivers – I always want to know if they play. But every now and then I come across somebody who tells me that they used to play but they quit because they stopped enjoying it. “Stopped enjoying it, are you crazy? !” I admit, sometimes that’s my first thought. But even being the 5-a-side evangelist that I am, I can relate to what they’re talking about. I haven’t enjoyed every single one of the hundreds of games I’ve played over the years. I know what it’s like to feel frustrated. But I also love the game, and at its best there’s nothing that can touch it. That’s why I keep coming back for more. You’ve heard me bang on before about the physical and mental benefits of 5-a-side, and why it is better than 11-a-side football, so I won’t go on about it more here. Suffice to say, I really believe there’s very little out there that can offer so much in terms of enjoyment, fitness and socializing with so much convenience. But it doesn’t always live up to the hype, and after a few weeks of not enjoying it you can find some people thinking about throwing in the towel. But that is one of the worst decisions you can make. What’s going to replace the 5-a-side hole in your life? Nothing, so you’ve got to get out of that funk. In most cases, a lack of enjoyment can usually be traced to one of a few problems – and these problems can be fixed, or at least avoided. So, hop onto the treatment table and let the 5-a-side doctor* diagnose your condition and get you back on the road to enjoying what should be one of your favourite things to do. Which of these problems are you suffering from? For some people it can be a source of major frustration when they’re not winning every game. Whilst it’s understandable to want to be competitive, it’s really important not to let that spill over into ruining your satisfaction with the game. I’ve seen players trudge inconsolably off the pitch at losing 8-4, when really that’s a fantastic result considering the relative ability of both teams. Yes, they might be the best player in the team, yes they might have been used to playing in better teams that were used to winning, but you don’t get any extra goals for either of those facts. All you’re doing with your despair is bringing yourself down, and your teammates aren’t exactly going to be getting a great sense of enjoyment from you acting like a prima-donna either. All of a sudden, it’s all got a bit too serious. Solution: realism is the key. It’s about more than just winning and losing; it’s about enjoying yourselves. You have to take each result on its merits and stop obsessing about results. Try to look for the positives in each performance and savour them. This doesn’t mean you need to be defeatist; it’s not about surrendering games. On the contrary, you should try to win every game, just give yourself and others a break if it doesn’t happen. Maybe you used to play a bit back in your day; you might even have been something a bit special. But remember, that was then and this is now. With the passage of time, injury and old age can chip away at us and leave us frustrated at not being able to do the things we used to do. You can’t expect to play like you’re in your early twenties forever. Being frustrated at not being able to recreate former glories is one thing, but there are people out there who’ve never even troubled the definition of an ‘average footballer’ who suddenly expect to be running the show at 5-a-side. If you’re more Maradoner-kebab than Maradona that’s fine, just don’t burden yourself and your teammates with all the frustration of thinking you should be playing to a level you’re not at. That’s no fun for anyone. The only thing that’s worse than putting unrealistic expectations on yourself is putting them onto other people. Seriously, nobody wants to be shouted at throughout a game of 5-a-side as if they should be playing like a Pro footballer. It’s not going to help you, and it’s going to grind everyone else’s gears. Solution: the 5-a-side doctor prescribes a strong dose of realism in cases like this. If your expectations are unrealistically high, you will ALWAYS leave the pitch frustrated. Stop burdening yourself and others with the weight of expectation. Release yourself from the shackles of expectation, be free and start enjoying things again. By the way, it’s perfectly possible to carry on playing as you get older and to enjoy it – see am I too old for 5-a-side? It can be really hard to enjoy playing against people who are much better than you, and equally a lot of people don’t enjoy playing games where it’s too easy, either. Solution: the doctor prescribes a change of medicine. Find a standard that you enjoy playing at. Some people need the competitiveness of organised leagues, others thrive in a more relaxed social kickabout, and for some there’s even walking-football. There really is something out there for everyone these days, so there’s no need to keep slogging away at something that’s getting you down. One thing to be careful of, though, is to make sure that you give your game a chance. Sometimes it might feel like everyone is better / fitter but you could just need a few weeks to get up to that level. Other times you’ll be a bit too far out of your depth and then it’s time to think about changing. 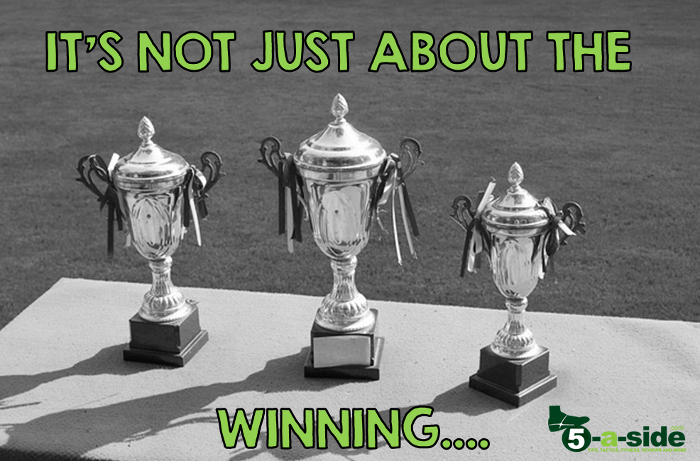 People play 5-a-side for three reasons: (1) for the love of the game, (2) to keep fit and (3) for the social side of it. That third reason is so often taken for granted that it sometimes gets forgotten. 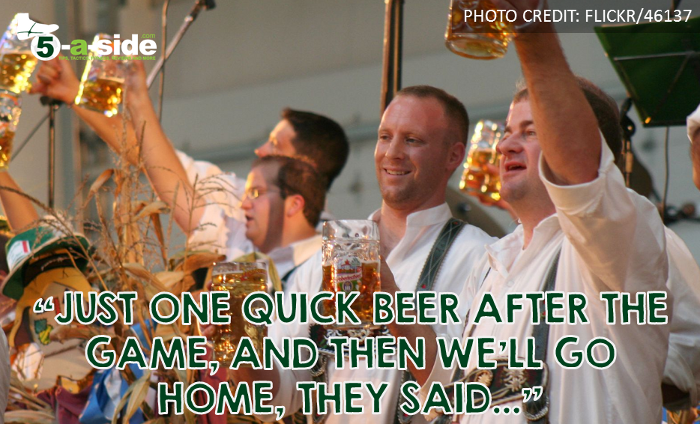 Nothing beats the post-game banter, or a quick drink with your teammates from time to time. Without it, you’re not getting the full experience, and going to 5-a-side can start to feel a bit like just going through the motions, almost like turning up for work. Solution: either rope a few mates in to play with you, or try to become more social with the group you’re already playing in. Some of the friendships made playing 5-a-side can last a lifetime. Don’t underestimate how much more enjoyable football is when you’re playing it with your mates. 5-a-side is played in a tight space. There’s plenty of running involved, but it’s short sharp sprints and not over the large distances that the 11-a-side game is. The tightness of it all is really hard to get to grips with. A lot of people try to play the 11-a-side game on the smaller pitch and finding the experience seriously frustrating. Instead they need to learn the specific skills and strategies to be good at 5-a-side. The transition from one game to another can be difficult to adapt to. Solution: Give yourself a break here. If you’re taking up 5-a-side for the first time, it will take a fair few games to get to grips with it. It’s natural to be frustrated by this. 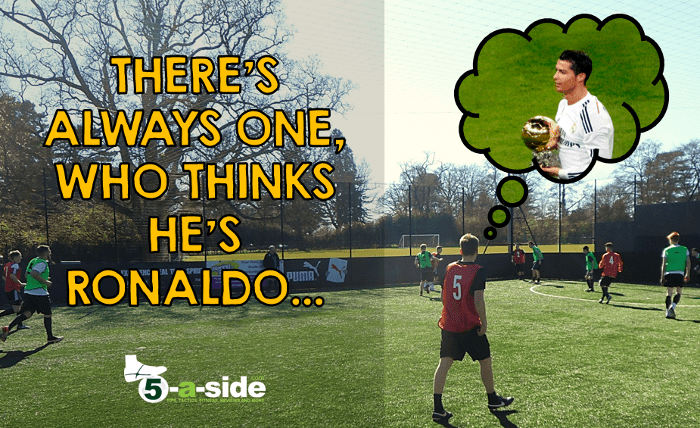 Give it time, and read this post to accelerate your adjustment to it: how to be good at 5-a-side. Is there a particular person that’s sucking your enjoyment out of the game? Often, one person can get on our nerves so much that it detracts from the fun of the game. Common complaints are: taking it too seriously, ordering people about, moaning at others, acting like a fool, not passing, and not bothering to defend. Solution: This is one of the trickiest issues. If you can learn to live with their flaws then that’s easiest, although these issues can often chip away at you, making them hard to ignore. Bottling them isn’t a great way to go in the long-term. First, subtly work out if anyone else has noticed this issue. It can be a big relief just to get things off your chest. If everybody has noticed it then you might be able to tackle it as a group – even dropping that player if a solution can’t be found. It sounds harsh, but you can’t let one bad egg ruin it for the majority. If it’s just you and it’s annoying you enough, then it’s worth saying something. Do it tactfully and in a friendly way – preferably not in a frustrated outburst. If it’s not getting any better, you might have to think about finding a different game to join. Chances are though, if it’s that bad you’ll be joined by a few of your other teammates who also want to get away. All of the above issues manifest themselves in feelings of frustration. If you find yourself feeling very angry, several notches up from mere ‘annoyance’, then that’s a bigger problem. You’ve got to get a handle on those feelings. Every now and then things bubble over, that’s not uncommon, but if you regularly find yourself going to 5-a-side feeling you want to fight, or verbally abuse people then that’s not normal. Solution: if this sounds like you, you need to read this article on how to control your anger and enjoy your football. The other thing to bear in mind is that these problems often stem from issues outside of what’s happening on the pitch. It can indicate other issues in your life and frankly, you need to get those sorted, not just to enjoy football, but to enjoy life in general to its fullest extent. For this you might need to look into seeing a properly trained professional. As you can see, all of the above can be fixed, but people often choose just to walk away from the game. That’s the worst thing you can do. It’s much better to tackle the issues head-on and keep playing the game you love. 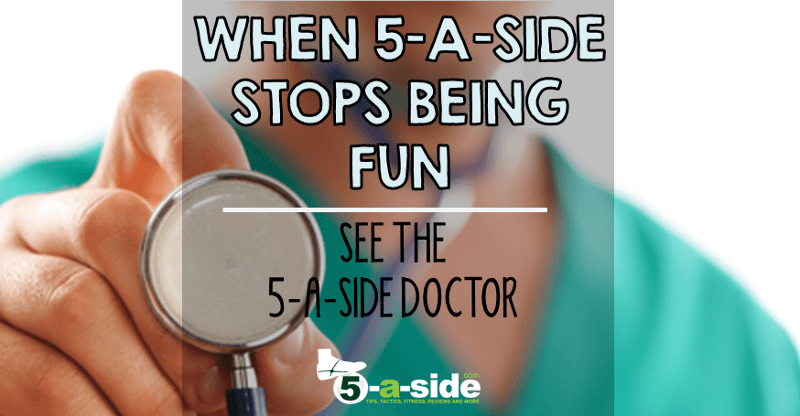 *The 5-a-side doctor is quite clearly not a real doctor and is no substitute for proper medical advice. I can’t believe I’m writing that. Always beware of fake doctors, especially where they want to administer suppositories. I have been playing with the same bunch of guys, once a week, for over 10 years but tonight I’m thinking of chucking it. I’m 58 and this one game a week was the main “bloke” social event in my otherwise family life. The problem is I am one of the slower players and I just get so easily marked out of a game. Plus the guys around me are barely passing to me. You know the ritual, you’re on one wing, a better guy is on the other, and nearly every keeper throw-out or pass from a teammate goes to the other guy, even when you are in space. I’ve tolerated this belittling effect for years but tonight was so bad, I feel I’ve had enough, even though packing this in will undoubetdly leave me sadder and lonelier. Hi Ali, I hope you didn’t chuck it in completely! It might be time to find a different game, one where you feel more comfortable with the speed of it. It would really be sad not to play with the group of players you’ve been with for a long time, but there are other options out there, and other good people who you’ll meet in other games. I wish you the best of luck! Rosco – that comment is the best. It just sums up everything that’s great about the game! It’s exactly why I love it, and why so many other people love it too! Absolutely brilliant! You’ve got about 7 years on me and your love for the game is an inspiration to me! I have a similar story to Adam, in that I’ve got my mojo back playing regular games with a group of friends. However, what was killing my enjoyment before isn’t in your list: A combination of extremely aggressive opponents and weak refereeing spoiled the organised league we used to compete in. Philip, thanks very much for the comment. I think that’s a great shout, and one that I’ve overlooked. I’ve heard that same complaint a few times so I’ll add it to the list. There are so many opportunities to play these days that people shouldn’t support badly run, ill-discipline leagues. Really glad to hear that you’re back enjoying it. A while ago I was so fed up with one of the 5-a-side groups I played in that I ended up giving up. For me it was a mixture of issues: people getting on my nerves and a few of them taking it too seriously. I stopped enjoying it so I started a new game with some mates who wanted to set something up on a regular basis. We had to find a few extra players but now we’ve got a good group that I really look forward to playing with and the fun has returned. It can be done. Cheers Adam, I guess sometimes that’s the way it has got to be. A totally fresh start. I’m glad you were able to make it happen and hopefully none of the problems that I mentioned above start creeping in! If they do, tackle them quickly as it sounds like you’ve got a good thing going on.